Base Brisbane Uptown is closest hostel to Roma Street Transit Station, we're so close that by the time you've picked up your bags you'll be putting them down again in your room. 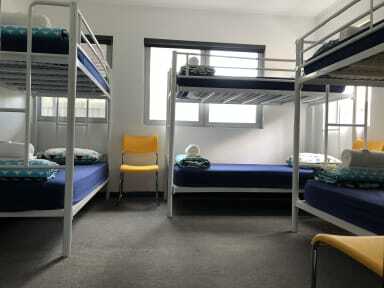 Speaking of rooms we have an array of rooms from privates to share dorms. We also have a kitchen and laundry room ready for you to use, where you'll also find yourself some television and games in our communal area. We pride ourselves on being in the heart of Brisbane, so drop off your bags and take a 10min walk over to Southbank where you can visit our Museums, GoMA and the very popular Southbank Beaches. Or take an easy 8min walk into the CBD and get some shopping done. Once you've done all that come back to us, where our bar The Guilty Rogue will be ready to help get your drink and feed on with 20% off all items. Participate in our Live music and play games to win a load of prizes. And if you have the guts take on our HELLFIRE challenge... if you dare! We offer FREE Wi-Fi in common areas and cheap Wi-fi in rooms from just $4 for 24 hours or $12 for a week. We're happy to accommodate you wherever we can, our travel desk is on hand to help you to wherever you go next. We have plenty of weekly packages if you'd like to shack up with us longer. Ótima localização, e ambiente bem animado. Tive uma ótima estadia e os funcionários foram muito atenciosos e solícitos comigo. Só aconselharia a colocar Lockers nos quartos.